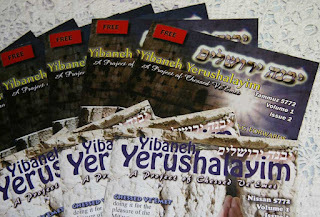 A few months ago we began our magazine "Yibaneh Yerushalayim" - May Jerusalem be Rebuilt. We have had some nice response and positive feedback. We are currently working on our next edition and wish to include some new features. We have a brief video to explain something of the magazine and invite you to get involved. If you live outside of Jerusalem, please subscribe to receive your edition in your mailbox. Please email us for further info. Together we can ensure a beautiful publication and G-d willing even potential work or work experience for the Chatanim and Kallot and Olim that we assist.